Dark chocolate may not only help you shed those unwanted pounds, it provides a host of healthy benefits that puts other indulgences to shame. Consuming an ounce of dark chocolate three days a week can help your body digest the food you consume, inhibit insulin resistance, reduce stress and cortisol levels and may prevent you from overeating. It is also proven to lower blood pressure, increase circulation, create a feeling of bliss and stimulate energy. One ounce of dark chocolate with between 70 and 85 percent cacao packs a punch in nutrition, but is costly for dieters who must limit their energy intake. At 170 calories, it is a treat that is best enjoyed in moderation, especially since it contains 12.09 grams of fat. There are three types of fat in dark chocolate: the good, monounsaturated fat called oleic acid, and two saturated fats, palmitic and steric acid. The good news is that these fats do not affect your cholesterol levels and can be considered a healthy fat; this is essential for those who are trying to lose weight. Dark chocolate also contains a healthy dose of essential minerals, including magnesium, calcium, iron, zinc, copper, potassium and manganese. When you eat sugary foods, your body can become resistant to insulin. This causes your body to produce more ghrelin, a hormone that increases your appetite. A study performed in the Netherlands, published in "Regulatory Peptides" in 2010, showed how dark chocolate inhibited insulin resistance and reduced ghrelin levels in 12 women who smelled and consumed dark chocolate. In conclusion, the women ate less food and felt more satiated after each meal. It is easy to sabotage your diet when you crave sweets, salty snacks, and fatty foods. Dark chocolate can satisfy these cravings nutritiously. Nibbling on a few unsweetened cacao nibs before each meal may help you make healthier choices when it comes to meal time. When you feel good, you naturally want to take better care of your body. Dark chocolate contains polyphenols that offer a sense of well-being. Swinburne University in Australia did a study, published in the "Journal of Psychopharmacology" in 2013, on how dark chocolate affected the mood and attitudes in adults. In conclusion, the people who had consumed dark chocolate for 30 days reported little change in mood, but a profound sense of well-being. This is due to the lipid in chocolate called anandamide, a chemical that offers a euphoric feeling that is often short-lived. Because dark chocolate also contains chemicals that inhibit the breakdown of anandamide, this sense of bliss and well-being lingers. Dark chocolate is an indulgence best consumed in moderation. Eating one ounce of dark chocolate three times a week is enough to offer lasting benefits. Like all foods, some people may be sensitive to chocolate and may have adverse effects. If you are taking medications or have undesirable consequences after consuming chocolate, please consult your doctor before ingesting this treat. Losing weight requires that you consume fewer calories than you burn each day. When combined with a healthy diet and exercise, dark chocolate can give you an extra boost toward reaching your weight-loss goals. 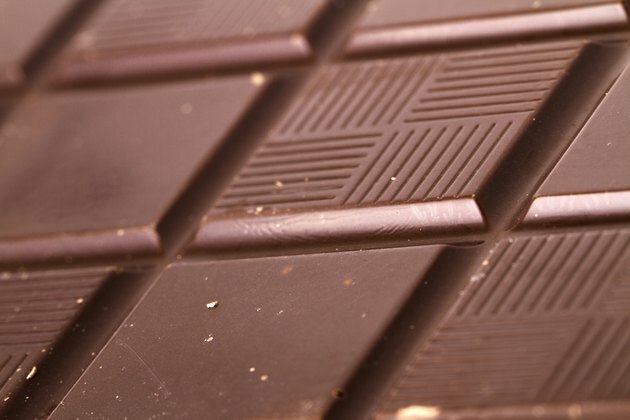 Can Eating Too Much Dark Chocolate Make You Sick?